Amadiya District (Kurdish Amêdî, Arabic: قضاء العمادية‎, translit. qaḍāʾ al-Emadiyah ; Syriac: ܪܘܼܣܬܵܩܵܐ ܕܥܲܡܵܕܝܵܐ‎, translit. 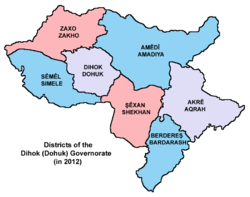 rûstāqā d-Emadiyah)) is a district in northern central Dohuk Governorate within the Kurdistan Region of northern Iraq. Administrative center is the city of Amadiya. The town and capital of the district, Amadiya. 30% being Assyrian and 70% being Kurds as of 2012.